With gratitude to all the friends and guests who entered, we are proud to announce that Anton Foltin of Phoenix, AZ is the grand prize winner of the second annual Colorado River and Trail Expeditions photo contest! In addition, Libeth Saenger of Aachen, Germany swept all three people’s choice categories. Anton’s winning image of Havasu Creek was taken during our 10-day photography workshop trip in the Grand Canyon in May of last year. Libeth captured her popular shots in August on our 12-day Alsek River expedition in Canada and Alaska. For their efforts, Anton will receive a complimentary 8-day Grand Canyon river trip this summer and Libeth will have her choice of our Utah trips. Cheers to our winners and their keen eye for photography! Anton Foltin‘s 2015 grand prize-winning photograph. Late afternoon light plays on the blue water of Havasu Creek. Grand Canyon NP, AZ. Next year, the winner could be YOU! CRATE’s photo contest begins with our rafting seasons each April and is ongoing throughout the summer. Participants on our trips are encouraged to upload a total of ten of their favorite images to share at www.crateinc.com, and can specify six to be entered into our contest. We offer three categories in which our guests can showcase their talents – “Scenery”, “Guides and Guests”, and “The River” – as well as two ways to win. The people’s choice winners are the most popular photos in each category. We track the ones that are shared the most and receive the greatest number of “likes” on social media. This year Libeth swept all three categories, but we have room for three photos and three winners here. Libeth Saenger’s winning photo in the “scenery” category. Sweeping vista of Lowell Glacier and Lowell Lake, with peaks of the Wrangell-St. Elias Range beyond, taken from the top of Goatherd Mountain. Alsek River, Yukon Territory, Canada. The grand prize image is chosen from the total pool of entries by an expert in the realms of river running and photography. This year’s judge was landscape photographer Tom Till, who – in the name of full disclosure – is also my dad. As a professional photographer, he has spent the last 40 years photographing around the world but concentrating on the Southwestern US. During that time he has logged many hours on the river, both as a boatman and a photographer. 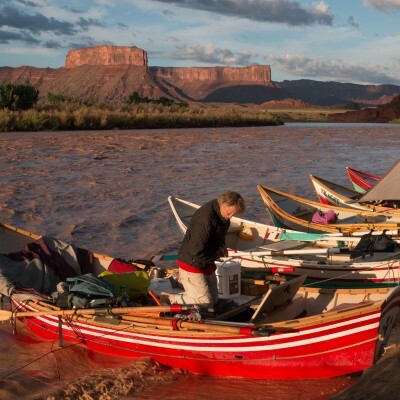 His gallery in downtown Moab, UT and his website, http://www.tomtill.com, showcase his iconic images of the Colorado River in the Grand Canyon and Canyonlands, as well as images from around the globe. I can say, with only a hint of bias, that he really knows his stuff. We are currently finalizing the entry process and prizes for our 2015 photo contest so look for more information here, as well as on our website, about how you can participate this summer. We want to see the canyon through the diverse and talented eyes of our guests, and share the images of the places we love with fellow river runners. Any and all photos that showcase the beauty, excitement, camaraderie, serenity and awe of a river trip are welcome. The more participants and images the better! To see the remainder of Libeth’s winning photos along with the rest of the incredible entries we received in 2014, visit www.crateinc.com and click on the “photos” tab at the top of the page. Posted January 27, 2015 by Crate Inc.